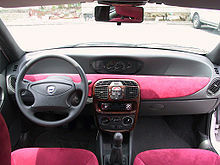 Alcantara is a microfiber material manufactured and marketed by Alcantara S.p.A., based in Milan, Italy. It is primarily used in the design, fashion, accessories, consumer electronics, automotive and marine industries. The material was developed in the early 1970s by Miyoshi Okamoto, a scientist working for the Japanese chemical company Toray Industries. It was based on the same technology as another product from the same company named Ultrasuede. Around 1972, a joint venture between Italian chemical company ENI and Toray formed Alcantara SpA in order to manufacture and distribute the material. The company is now owned by Toray and Mitsui. Alcantara is composed of about 68% polyester and 32% polyurethane, giving increased durability and stain resistance. The appearance and tactile feel of the material is similar to that of suede, and it may be identified as such. Some versions are designated as flame retardant in order to meet certain fire standards for both furnishings and automobile applications. Alcantara applications include furniture, clothing, jewelry, safety helmets and automobiles. In the latter it is used in seating, dashboard trim and headliners by many high-end OEM automotive suppliers. In the world of high fashion, Louis Vuitton uses Alcantara linings in many of its bags. Most famously, it appears in the collaboration with Takashi Murakami under the creative direction of fashion designer Marc Jacobs, wherein the white Multicolor Monogram bags have a bright fuchsia Alcantara lining. Alcantara is used as a flame-retardant driver seat covering material for Formula One race cars, including the Williams Formula One 2011 FW33 car. It is also used as a covering material for high-end headphones, including the Sennheiser HD800, the Sennheiser Momentum On-Ear, and Bose QuietComfort 35 as well as for other consumer products, such as Microsoft's Alcantara keyboard cover for Surface Pro (2017) and Surface Go, Microsoft's Surface Laptop keyboard and Samsung's Galaxy S8, S8+, S9, S9+ and Note 8smartphone covers. Alcantara is also used in the SpaceX Crew Dragon capsule. ^ "Surface Go Signature Type Cover - Microsoft". Microsoft Store. Retrieved 2018-08-30. ^ "Surface Laptop detail page on the usage of the Alcantara fabric". www.microsoft.com. Retrieved 2017-05-06. ^ "SpaceX on Instagram: "Crew Dragon can have up to seven seats, which are made from the highest-grade carbon fiber and Alcantara cloth."". Instagram. Retrieved 2015-09-11. ^ "SpaceX Website: "Crew Dragon"". SpaceX.com. Retrieved 2019-01-07. This page was last edited on 25 February 2019, at 04:52 (UTC).